We've been informed that there is a CHANGE OF PLANS!!! 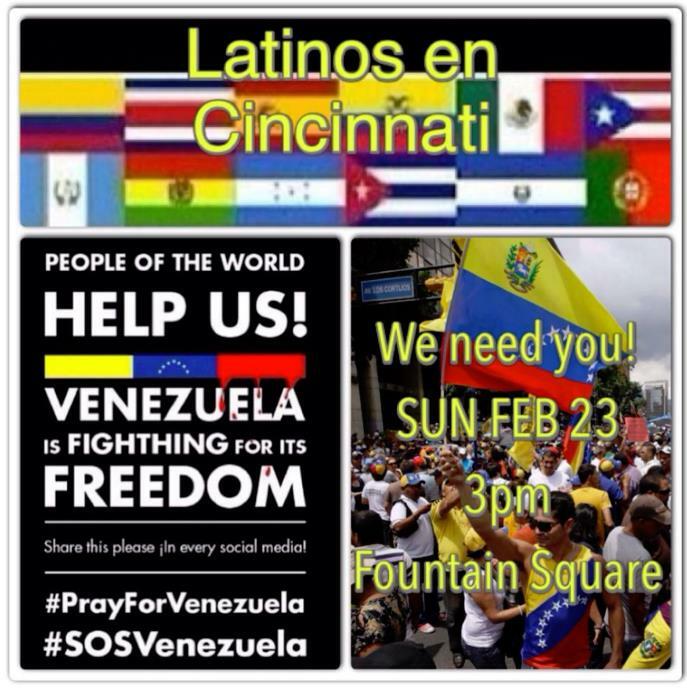 Sunday 3 PM on the Fountain Square!!!! Our friends from Venezuela would like to invite everybody to support them in their effort to raise the awareness about the tragic situation in their country. On Feb. 15th we'll be celebrating Valentine's Day! FREE huge parking across the street! Start your new year off right with Art After Dark in Eden Park. Make a date with our artwork at this month’s Final Friday happy hour and tango through the most romantic works in our collection. Gear up for Valentine’s Day by taking an instructional tour of "How to Bring a Date to the Art Museum" and enter our Romantic Raffle to win a Valentine’s Day gift package from our Terrace Café. Latin dance... performances by MidwestLatino and music by DJ Rudy Alvarez from 6 – 8 p.m. Special Tango performances at 6:15pm and 7:30pm. FREE event with drinks and appetizers available for purchase. Reservations not required. Parking at the Art Museum is $4; FREE for Art Museum Members. Enter to win an exclusive Valentine's Day Dinner at the Cincinnati Art Museum on February 14. We will do all the planning for you! Dine in our beautiful Great Hall, enjoy romantic music and a special sneak-peek tour of our brand new exhibition Genius and Grace: François Boucher and the Generation of 1700. A $200 value, 4 course meal and one bottle of wine included. Five lucky couples will win. To purchase tickets, please visit our Visitor Services Desk during Art After Dark on January 31. Raffle Ticket Prices: $5 for one ticket or $20 for five tickets. Winners will be notified on Monday, February 3, 2014. Last Saturday, January 25th, 2014, we had our first Salsa Party at MVP Bar. Our first Salsa event at MVP a total success!!!! Some of you came even all the way from Lexington and Dayton to party with us! WOW! We very much appreciate it! It was a FANTASTIC night, with amazing performances by Salsaires Cincinnati and by "Dare To Dance " dancers! Last minute updates: This party is getting hotter by the minute!!! Not only will we have the wonderful dancers from "Salsaires" performing, but also the amazing "Dare to Dance" team! To celebrate it - it will be a FREE event for all! We just want you to come and explore the venue, and have fun with us! Invite your friends! Let's make it BIG!!!! New exciting events, new venues! Come and join us for Salsa/Bachata fun! As they say: when one door closes, another opens! Our Goodbye to Penguin" Party was AWESOME! I couldn't imagine a better and nicer way to say Goodbye to Penguin than our party on Monday! Thanks again to everybody who came last night! It's so great to have so many good friends who share the same passion for Salsa! "It was our absolute pleasure, the best salsa party I've ever been to. The music mix was amazing, varied, modern, and energetic. Thank you! The Cincy crowd are the friendliest, most fun, and enjoyable people to dance with and along. You guys are awesome!" SAVE THE DATE: May 2015. We'll be celebrating 10 Years of Salsa Wednesdays by MidwestLatino and DJ Rudy! Join us on Monday, Dec. 30th, to say Goodbye to Penguin, and a Goodbye to 2013 at our "Pre-New Year's Eve Salsa Bash"
so please come and join us, and let's have our last party the BEST EVER! NKU Latino Programs and Services invites you to a special keynote lecture series that features the national bestselling author Victor Villasenor. Victor's presentation which is entitled: Promoting Genius: How to access your inner genius, is part of the National Hispanic Heritage Month events. Victor Villaseñor is the author of the national bestsellers Rain of Gold, Thirteen Senses, and Burro Genius, as well as other critically acclaimed books such as Crazy Loco Love, Wild Steps of Heaven, and Macho!. He is also the author of five ancestralthemed bilingual children’s books and has written several screenplays, including the award-winning Ballad of Gregorio Cortez. Villaseñor, a gifted and accomplished speaker, continues to live on the North County San Diego ranch where he grew up and is currently writing the finishing touches of Revenge of a Catholic School Boy, which will be available as an ebook mid September. Le Mode Avant means "Fashion Forward" in French. Cincinnati is a big city with a small town feel, but there is plenty of potential to be "Fashion Forward." Le Mode Avant is a FASHION SHOW showcasing original designs by Angelo Axel Culvert of our very own Pretty Penguin Studios with the support of our amazing style team. We will be partnering up with FashionCincy.com, Kaze OTR, Midwest Latino and the AMAZING help of Heyman Talent Agency to throw a fashion show worthy of the tents at Bryant Park in NYC during fashion week! On Friday, August 9, from 11 am – 2pm, the community is invited to attend an awards luncheon honoring Latino Cincinnati Reds baseball players Aroldis Chapman, Johnny Cueto and Alfredo Simon for their contributions to advancing the city’s Hispanic community. 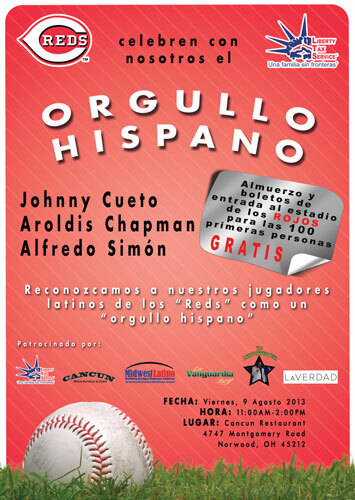 All attendees will be able to mingle for two hours with these top athletes, but as a special treat, the first 100 Latino families with children will receive free meals as well as tickets to that evening’s Reds game against the San Diego Padres – one of three Hispanic heritage-promoted games this season. The event, which is presented by both Liberty Tax Service, a subsidiary of JTH Holding, Inc. (NASDAQ:TAX), and the Cincinnati Reds, will be held at Cancun Mexican Bar and Grill (4747 Montgomery Road, Norwood, OH, 45212). Latinos have had a significant presence in the evolution of the “Great American Pastime” since the 1880s. Today, approximately 28 percent of baseball players in major leagues are Latinos with 10 percent hailing from the Dominican Republic. Fittingly, two of the award winners, Cueto and Simon, are from that beautiful island. The third winner, two-time National All-Star, Aroldis Chapman (aka “The Cuban Missile”), is from another Caribbean island, Cuba, which has been producing star players for the team since 1911. Smell the Scent of a Guinness World Record with Gain! Celebrate the music from Colombia with Pasitico Band! FREE Parking across the street!